I still haven’t figured out why the home match versus Long An was moved from the weekend to the rather odd time of 5pm on a late Monday afternoon. For the purpose of TV perhaps? It certainly wasn’t to try to generate more fans through the gates; it would certainly hinder the local Hanoians attending, with work commitments and collecting kids from school. This was instantly a slight problem for me too, seeing as I have a job! I could have possibly just made it for kick off on time but decided to sneak out of work slightly early so I could appreciate some of the pre-match build up. Ha Noi has recently been experiencing something of a heat wave. It’s hot anyway at this time of year, but temperatures soared way above 35C. With this in mind, I was expecting a slow paced game and a subdued atmosphere. Most fans, including myself, had opted for the main stand with its roof and shade. The Hanoi T&T fan group who normally sit in the open stand opposite had decided to hold their positions outside in the shade until a few minutes before kickoff, when they all rushed in and quickly set up the drums and distributed the yellow flags and ribbons of T&T. As the game kicked off, approximately 5 people clapped in support of these 22 players plying their trade in the incredible heat. As expected the game began at a slow pace, reminiscent of a training session. 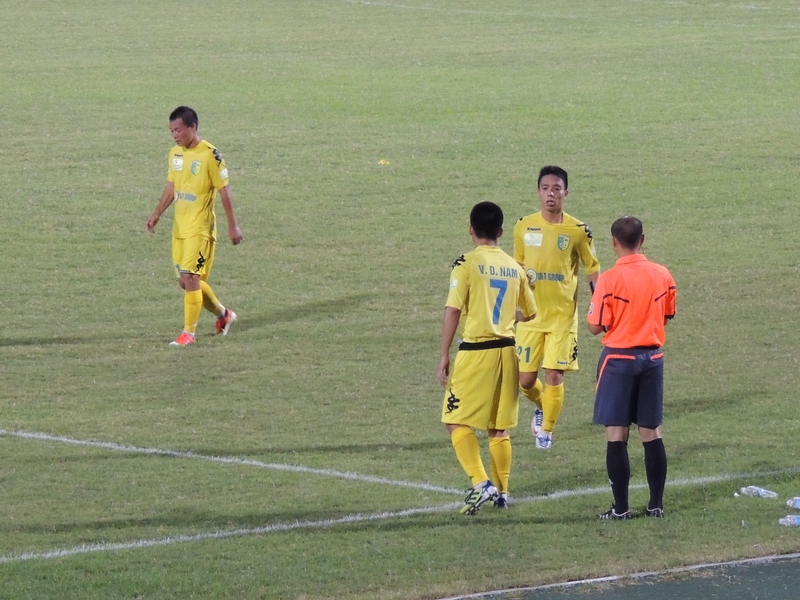 An early chance fell to Long An’s Tran Bao Anh, who raced cleared but his shot was easily saved by Hong Son. TV replays later showed that it was a shocking decision by the linesman as he was clearly offside. T&T’s Quoc Long then produced some good work to set up Samson who scuffed his shot. The game was very slow but chances were beginning to be created. T&T’s Sy Cuong tried his luck from distance and the lively Kanu for Long An had the ball in the net only to be rightly ruled offside. On 32 minutes the best chance of the game fell to Nguyen Thanh Hai of Long An, again beating the offside trap he poked the ball past Hong Son in the T&T goal only for the ball to creep agonizingly past the far post. As Long An were beginning to play like a team above their league position, I was starting to worry this could be another Binh Duong result. Before the half was out Kanu raced cleared and his low shot fortunately ricochet off of T&T central defender Van Bien and out for a corner. Half time 0-0. 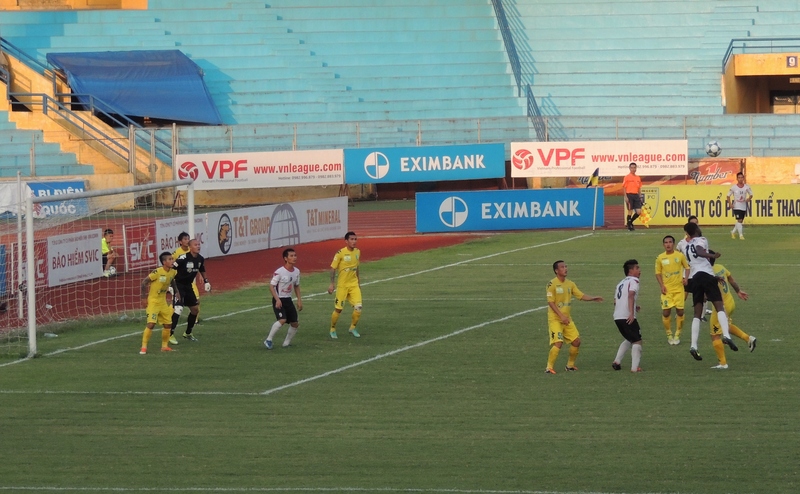 Ha Noi began the second half brightly, with Samson setting up Ganzalo, who shot straight at visiting ‘keeper, Quoc Cuong. Three minutes later T&T were 1-0 up; the impressive Ngoc Duy played a beautiful cross to Samson, who powered his header in to the far corner. Long An responded well and Kanu sent through Le Isaac, who poked the ball past the advancing Hong Son, but again beyond the far post. On 59’ minutes the ball fell to T&T’s central defender, Cristiano, who played an amazing, first-time high long ball across field to Samson, who in turn skipped past one defender. With time to look up, he played it to Gonzalo who drill the ball in to the corner of the net from 20 yards. 2-0 and a wonderful goal. Less than ten minutes later, Long An finally got the goal they deserved; after a low cross and a comical mishit the ball fell to Kanu who coolly finished. 2-1. This inspired T&T to up their game, a trait that I’m starting to really notice; HaNoi are a much better second half side, seeming to conserve energy in the first half and really start to play in the cooler heat of the second half. On 75’ Hong Tien play the ball in to the area and it fell perfectly for the Vleague’s topscorer, Gonzalo, who powered his header beyond Quoc Cuong in the Long An goal. 3-1. 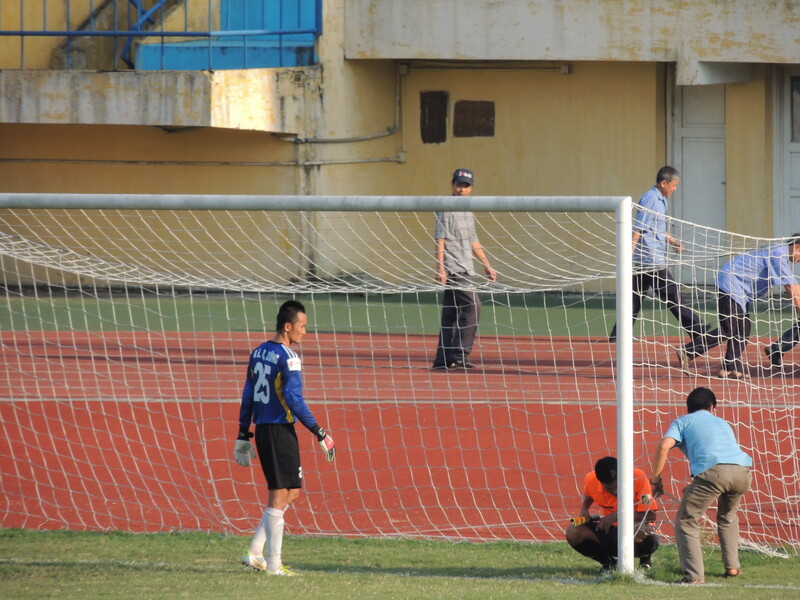 Thanh Luong, so impressive in the game against Hai Phong, then came to life and began twisting and turning past opponents; only to drill his shot just wide. 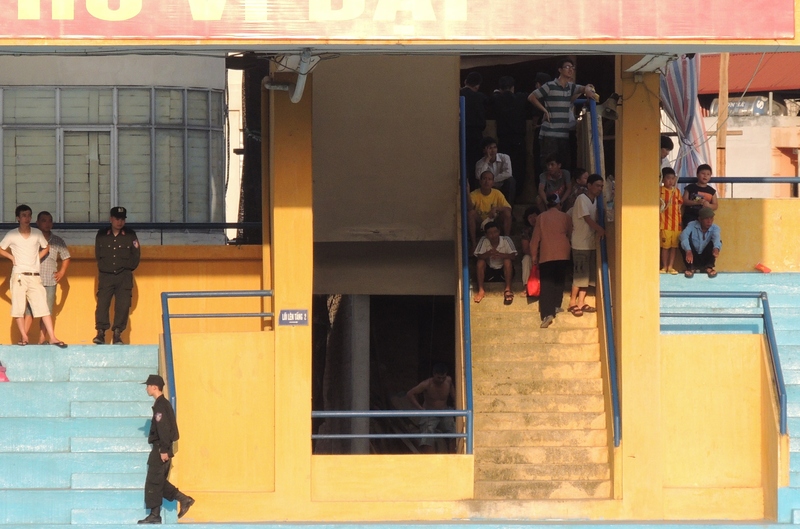 At this point the stadium announcer informed the fans that Da Nang had beaten Song Lam Nghe An 3-2, a result that would leave T&T a point off the top with a game in hand and a vastly superior goal difference. The fans around us began to cheer and there was still time for one more goal from T&T. A long ball was sent into the Long An half, totally deceiving the weary defence and Van Quyet raced clear, danced around the ‘keeper and passed the ball into the net. 4-1! A fine win for T&T, who are now firmly in with a shout at the title. I just hope the fixture changes are kind to all fans from now on as only (not official) 1000 fans made it to the Hang Day on this incredibly hot evening. Next up, after the international break, is another home match versus Ninh Binh and hopefully Ha Noi T&T can avenge the 0-2 defeat earlier on in the season.